The Laughter Clinic, combines comedy and laughter with the latest information and research in Suicidology to produce a fun, yet very powerful experience that helps participants find ways to increase their daily exposure to humour and laughter. Welcome to The Laughter Clinic our flagship product/service of Comedy Unlimited. As our by-line “Exploring the Power of Laughter” suggests, The Laughter Clinic is all about finding ways of ‘activating’ the power of laughter, in order to help minimise the symptoms of stress, depression, and suicidality. The more I learn about the complexities of suicide, and the multifaceted problems associated with suicide prevention, the more I believe in our innovative approach to a problem that has unfortunately reached epidemic proportions. Globally, the suicide rate in 2012 was estimated at 804,000 people per year, even more staggering, is that for every one of these people who tragically end their own life, there are approximately 20-23 people who make a non-fatal attempt. That being the case, an estimated 16 million people a year globally attempt suicide. In Australia, where I live, the 2014 suicide data presented by the Australian Bureau of Statistics recently stated that in 2014 there were 2,864 deaths by suicide, which would put our attempted suicide rate at well over 50,000 people per year if these current estimates are correct. In suicide prevention we talk about the 3 tiers of prevention, Primary, Secondary, and Tertiary. Our focus at The Laughter Clinic, is on Primary Prevention. That is, basically facilitating, or increasing the psychological, emotional, and sociological well-being of the population, while at the same time reducing their exposure to the known risk factors of suicidality. There’s a lot more to it than that obviously, however that’s the very basic gist of Primary Prevention, increase exposure to the good stuff, while decreasing the bad stuff. The Laughter Clinic can play a significant role at the Primary Prevention level. 45 – 60 minute highly interactive presentation aimed at minimising symptoms of stress and depression using humour & laughter, improving connectedness and overall mental health. 4 x 45 mins Workshops These include practical tools for participants to use in their personal and professional lives which are aimed at helping increase mental wellness and productivity. One on one consultation with Mark McConville to help facilitate increased exposure to humour and laughter, for personal & professional benefits of private clients, and or organizations. We conduct research into the effects of humour and laughter in regards to minimising the symptoms of stress, anxiety and depression, therefore quantifying their protective value against suicidality. Thank you for taking the time to learn more about The Laughter Clinic, and our services. We look forward to your feedback, and hopefully your company, as we take action against all that is not funny in the world, by decreasing the bad stuff, while increasing the good stuff. Australian Institute for Suicide Research and Prevention. (2015). Module 2: Interpreting Suicide Research Part 1. (2014). Preventing Suicide A Global Imperative . World Health Organization. Hey everyone, Mark McConville here. Just wanted to say a quick thank you for your continued support of both Comedy Unlimited and Living with Laughter this year. For me personally, this year has been quite challenging with the undertaking of university studies for the first time in my life and having to at the same time, deal with some family issues that have been quite time consuming. I’d like to take this opportunity to thank Jennifer Burke for her continued work in helping supply social media content for our Facebook pages while I’ve been focusing on my studies and looking after mum. 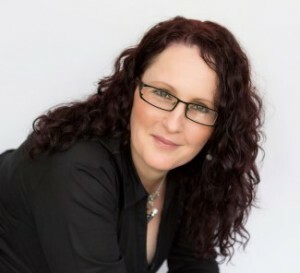 I urge anyone who is looking for a social media support person to get in touch with Jen, if you would like her contact details message me here and I’ll pass them on. Now that I have finished my first year of Uni, the wait begins to see how I fared in the marks department. Passing this year’s course will mean that I can graduate in Dec with a Graduate Certificate in Suicide Prevention Studies. Should I pass with a high enough grade I will qualify to continue on next year with the Masters of Suicidology program. This would mean a further two years of study and would allow me the opportunity to undertake research into how comedy and laughter could be used to actively help reduce stress, anxiety, depression, and suicide ideation. Conducting research in this area is all part of the bigger picture to help us work towards our goal of formally linking the comedy industry to that of mental health. Let’s not forget our vision of ‘Bulk Billed Laughter”. Wouldn’t you love to be able to take your receipt from purchasing a comedy club ticket or comedy dvd to Medicare and get a percentage rebate of the purchase price? Maybe, just maybe, achieving this might just reduce the real figure that I believe we need to be focusing on, that of the 65,000 Australians that attempt suicide each year. So once again, thank you for your ongoing support of everything that we are working towards, and if there is anything that we can do to help you, please do not hesitate in getting in touch. With the craziness of what is happening in the world at the moment, I sincerely hope that everyone is healthy, happy, and finding a way to bring laughter into your life, and into the lives of those around you. If however, you’re finding it hard to find anything to laugh at, I firmly believe that we can help you with that. I have been invited by The Australian Institute for Suicide Research and Prevention to be a guest speaker at this years World Suicide Prevention Day Forum being held in Brisbane on the 10th of Sept. This is a huge honour for me as I will be amongst some of Australia’s leading people in the field of suicide prevention and research. I will be talking about the role humour and laughter has to play in regards to reducing the impact of stress and depression which hopefully leads to a reduction in suicide ideation of the sufferer. 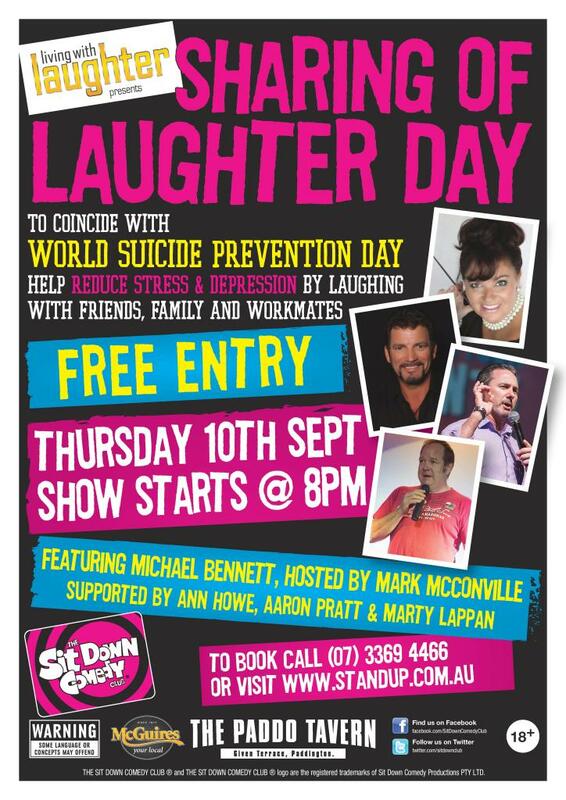 Once again we have partnered up with The Sit Down Comedy Club in Brisbane to put on our second annual Sharing of Laughter Day FREE EVENT. Below is the poster and I’d like to thank Mike Bennett, Anne Howe, Marty Lappan and Aaron Pratt for all putting their hand up to perform for us. Also, we wouldn’t be able to put this event on if it wasn’t for the ongoing support of Fedele Crisci from the Sit Down Comedy Club Brisbane. To learn more about our Sharing of Laughter Day initiative CLICK HERE. Mark talks about his first semester studying suicide prevention. Hi folks, hope everyone is well. Just thought I’d share some key info from my first semester of Uni. Very excited to be presenting my new “Laughter Clinic Keynote Presentation” for the Qld Mental Health Alliance tomorrow. This keynote offers lots of laughs while also giving the audience some valuable take away information and tools to help reduce stress, anxiety and depression.